Achill Island and the Curraun Peninsula offer some of the most spectacular walks and treks in Ireland. Unlike many popular walking areas in the west of Ireland, most of the countryside on Achill is in common ownership, which means that it is open and freely accessible for hillwalkers. There are few, if any, fences or other barriers in the upland areas of Achill. Achill's landscape is perfect for walkers of all abilities. The two highest peaks are on lower Achill - Slievemore (671m) can be approached from its eastern end at Dugort or from its south-western slopes above the Deserted Village. Croaghaun (668m) dominates the western end of Achill Island and its inaccessible northern face features sheer rock cliffs - they are said to be the highest sea cliffs in Europe. 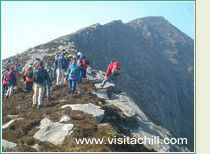 An annual Walks Festival, organised by Achill Tourism, is held in March. This event includes guided walks from a qualified mountain skills leader, who offers local history and folklore along with mountain skills tips and insight into the local archaeology and geology. A guidebook offering details of 14 circular walks on Achill is also available from Achill Tourism. This bi-lingual (English and Gaelic) publication includes maps and information on points of interest on all 14 walks.